A family is heartbroken after their 4-year-old French Bulldog, Porscia, died of a heat stroke at Lucky Dog Day care and Resort of South Tampa. “I just knew, I just knew she was gone. I couldn't understand why this had happened,” Mia Norton said through tears. Norton says Porscia wasn’t just a pet she was family. “Porscia and my son were very very close and they did everything together," Norton said. "Porscia was always part of our family she was part of everything we did." Norton says part owner of Lucky Dog, Jack Hamilton, called her Saturday with the horrific news. Hamilton told ABC Action News reporter Michael Paluska that the protocol set by the business is to start bringing all of their dogs inside by 11:00 a.m. Hamilton said they should start the process at 10:30 a.m. According to Hamilton, the employees working on Saturday did not follow procedure and Porscia died because of it. 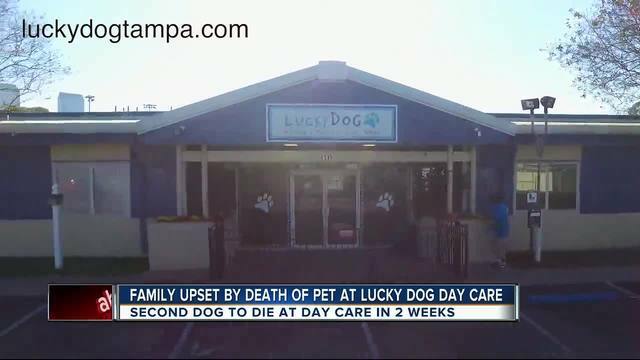 Weeks earlier, another dog died at the daycare due to heat stroke. Hamilton said they had a meeting after that death and told all of the employees they needed to follow protocols but that still didn’t happen. Brianna Bermudez told ABC Action News she has complained to the owners that there aren’t enough employees on staff to safely monitor the dogs. After the general manager, assistant manager, dog trainer, and kennel manager were fired Bermudez and a handful of other staff walked out. Bermudez said the employees did everything right. Norton says the vet told her Porscia’s temperature was 109 degrees. “I just think they got too big,” Norton said “We noticed a huge change. They remodeled everything and we noticed there was a lot more dogs. This shouldn't happen. You take the extra precautions, you get the extra staff to ensure that this doesn't happen, there is nothing anyone can say or do to bring my dog back."